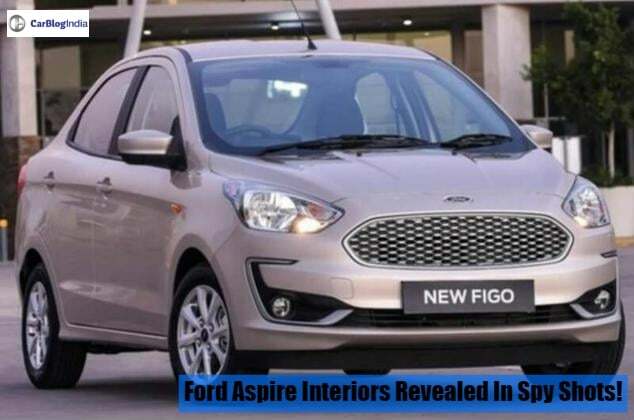 Ford Aspire Facelift interiors have been revealed in the latest spy shot. 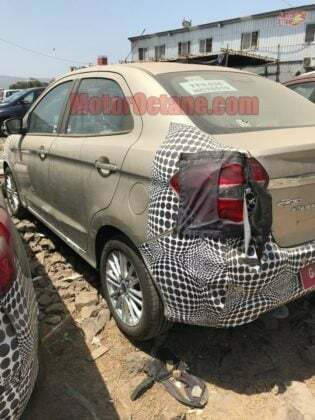 As per media reports, the facelift sedan is going to launch on 4th October. It gets a new petrol engine, some feature, and cosmetic upgrades. Recently, we did a story that the Ford Aspire Facelift is going to get a new 1.2 Litre petrol engine. For the past few days, various media reports are suggesting that the facelift is going to launch on 4th October. Well, this time is perfect for a launch as it falls right between the festive season. So, now, a MotorOctane reader has spotted the facelift at one of the dealership stockyards. 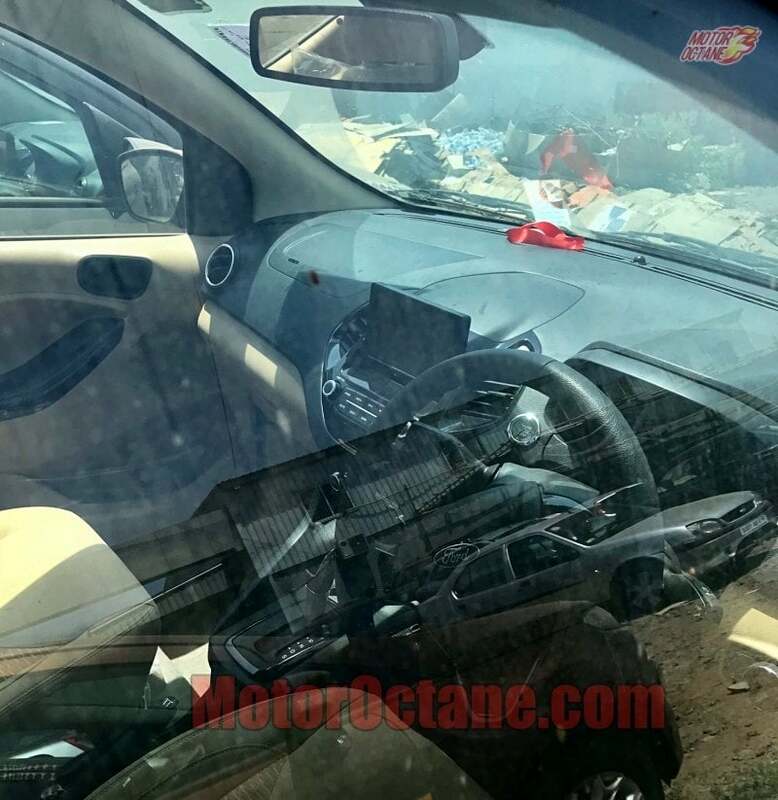 With these spy pictures, we get an idea of its interiors clearly. 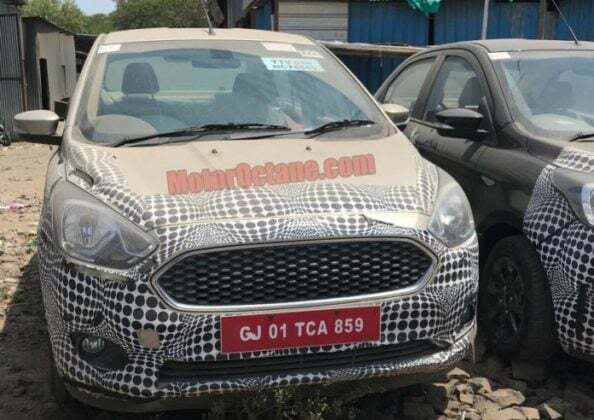 The feature upgrades would include features from the recently launched Ford Freestyle. It has been spotted a couple of times earlier, near to its plant in Gujrat. The sub-4 meter sedan is expected to be priced starting from Rs 6 Lakhs up to Rs 9 Lakhs. Now the first thing that we see is the 6-speed DCT unit. Also, you can see the new floating touch-screen infotainment system. It continues with a black-beige dual-tone interior. The spied mule is the top-end variant as you can see the engine start-stop button. The rest of the interior looks similar to the Ford Freestyle. On the exterior, it sports a new front grille, similar to the Ford KA+. Also, the Aspire Facelift will get a revised sportier bumper, revised fog lamp housing slot with chrome inserts around it. Also, a new set of alloy-wheels are seen onboard. At the rear end, it will get a sportier bumper along with faux air-vents at the edges. Currently, the Aspire comes in three engine options – a 1.2 Litre petrol, 1.5 Litre petrol for Automatic and a 1.5 Litre diesel. The Aspire facelift will get a new 1.2 Litre 3-cylinder petrol engine. This engine produces 96 BHP of max. power and 120 Nm of peak torque. The diesel variant outputs 100 BHP of power and 215 Nm of peak torque. The facelift comes mated to a 5-speed manual transmission along with a 6-speed DCT unit. Features onboard the Aspire Facelift will include Turn indicators on ORVMs, LED DRLs, SYNC 3 infotainment unit, Rear AC vents, Auto headlamp on/off, Rain-sensing wipers, Ford MyDock, and Ford MyKey. The SYNC3 infotainment unit comes with Apple CarPlay and Android Auto. Safety features onboard will include Dual Front Airbags, Side and Curtain Airbags, Anti-Lock Braking System, Electronic Brake Force Distribution, Reverse Parking Sensors, Reverse Camera and Speed Sensing Auto Door Locks. Looks like the Aspire Facelift is now a better rival. Lastly, we expect it to be priced starting at Rs 6 Lakhs and might go up to Rs 9 Lakhs. At this price, it will take on the heavyweights Honda Amaze, Maruti Suzuki Dzire, Hyundai Xcent and Tata Tigor.